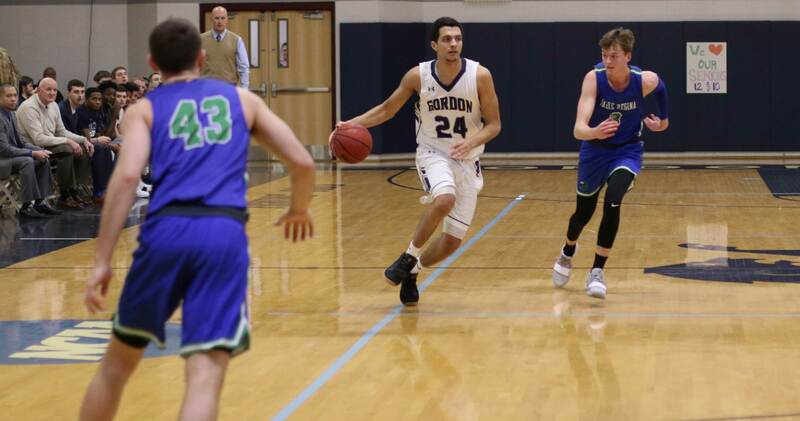 (Wenham MA) “When Eric is shooting the ball the way he was today, there aren’t too many teams that are going to beat us,” explained Gordon coach Tod Murphy after the Scots routed Emerson, 89-62. 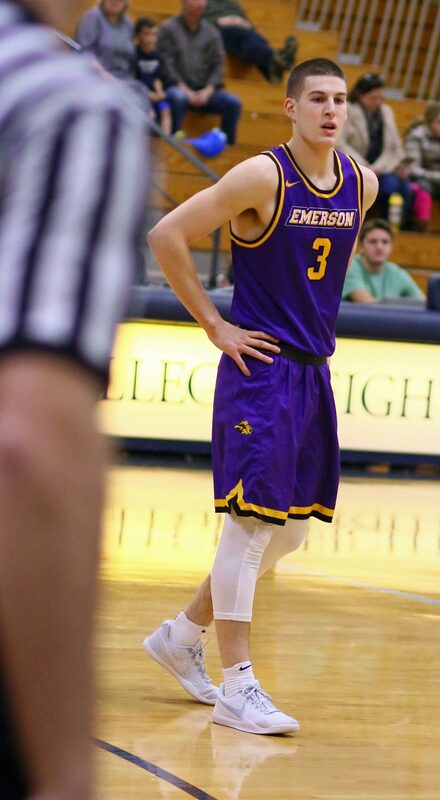 The “Eric” Coach Murphy was referring to was sophomore Eric Demers who had a couldn’t-miss Saturday afternoon with a career-high 31 points. The Lions (6-5) put at least three different defenders (by my count) on Eric with no noticeable decline in his production. 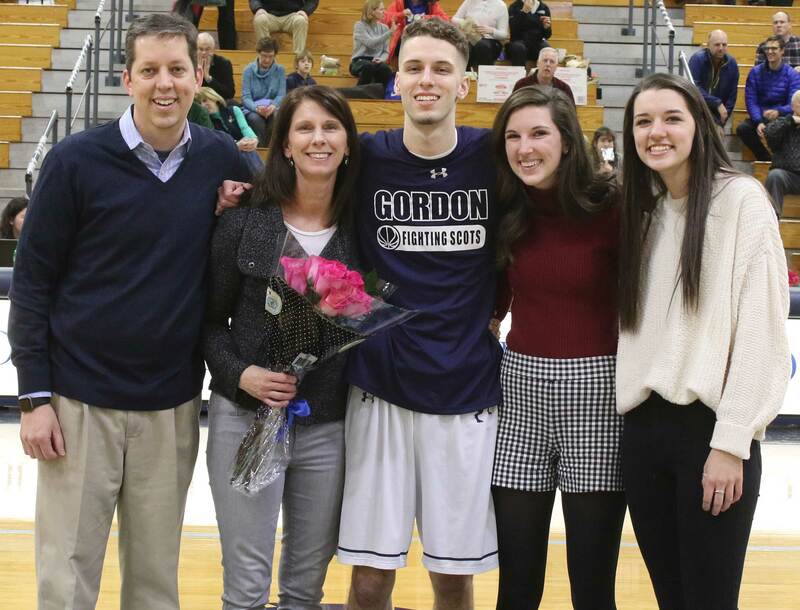 The Falmouth (MA) grad made only three from long range but had nine other makes off drives and jump shots. 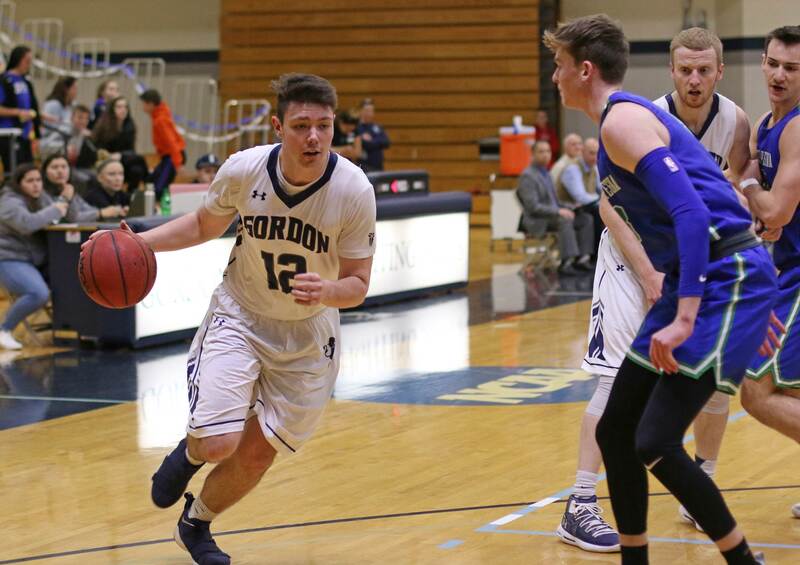 The Scots (4-4) broke away from a 12-7 deficit in the first five minutes and followed Eric’s eighteen-point, first-half to go on a 42-20 run over the final fifteen minutes of that half. I expected that Emerson would cut into GC’s halftime 49-32 spread in the second half, but I was wrongly assuming that Eric would cool off. He didn’t, and his additional thirteen points led the Scots (4-4) into leads of over twenty points. 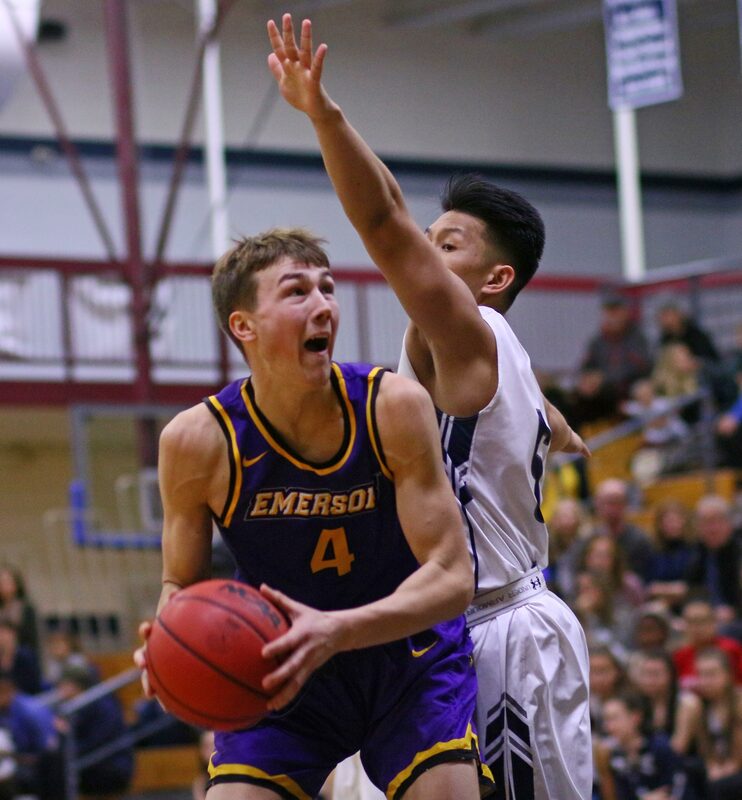 On this afternoon Emerson had no defensive answers and when Eric left the game for good, with eleven minutes remaining, Gordon was in front, 71-43. Garrisson, himself, did get a terrific pass from teammate Josh Ribeiro that set him up for a crowd-pleasing jam. 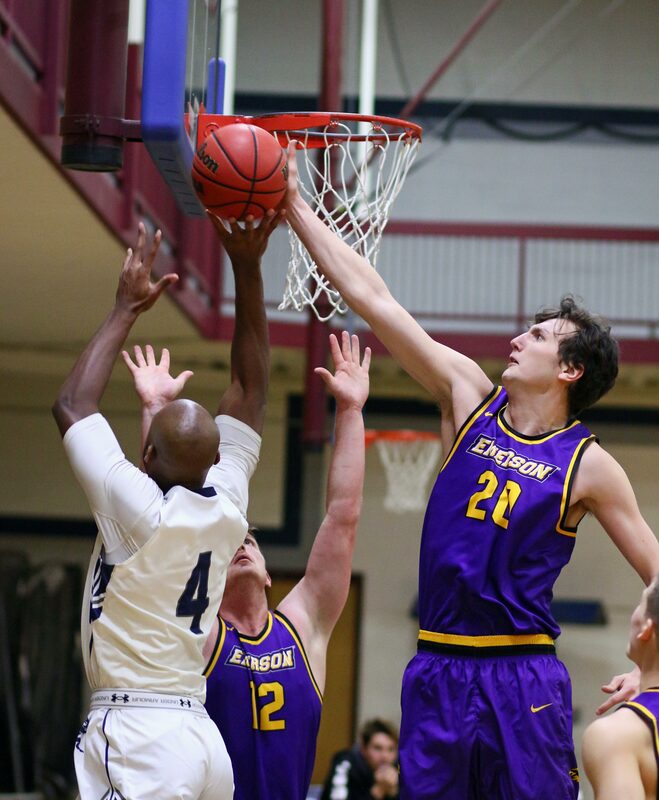 Junior Geoff Gray (Newton South) maintained the team-leading stats he came in with getting twenty-one points and pulling down nine rebounds. The rest of the team from Boston suffered through a dismal afternoon. 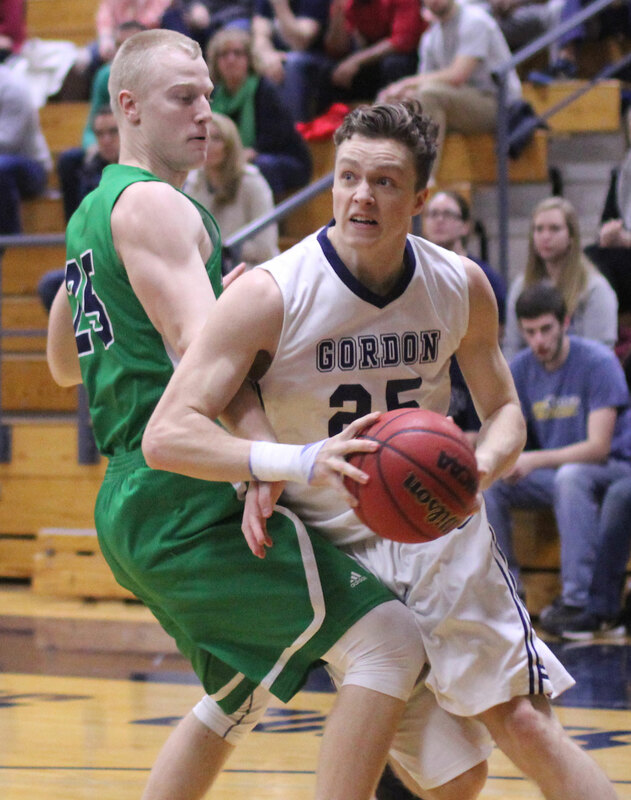 Two Gordon freshman put up nice numbers: Parker Omslaer had six rebounds while Josh Crutchfield had six assists. Emerson fourth-year coach Bill Curley is the former Boston College star who, like Coach Murphy, had an NBA career. 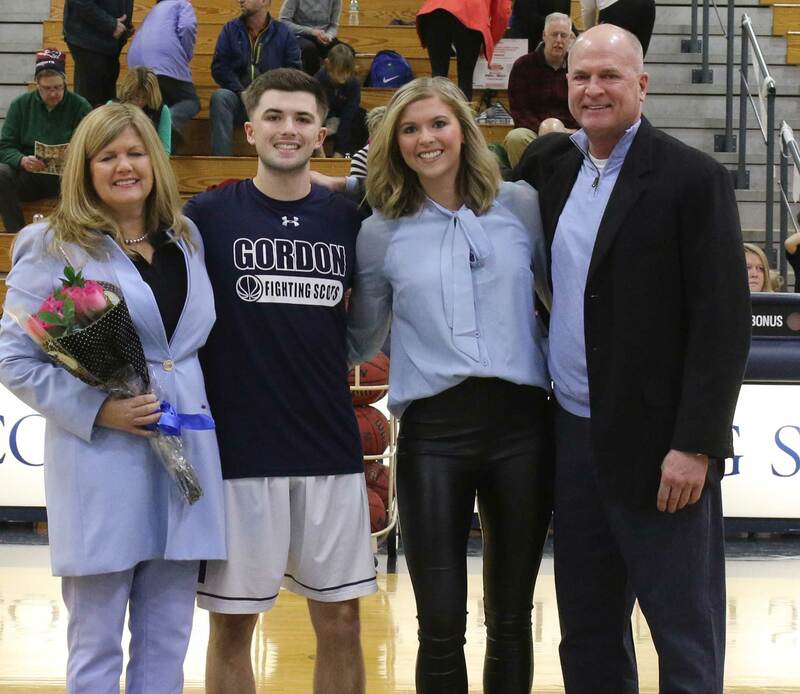 The Gordon team will be getting together after Christmas for a flight to California to face Redlands (December 28) and Whittier (December 30). The Dempsey brothers (Dave & Jason) took this one in as well as Hans Miersma. No sign of Emerson alums Jay Leno and Sam Presti (GM at Oklahoma City) in the house. 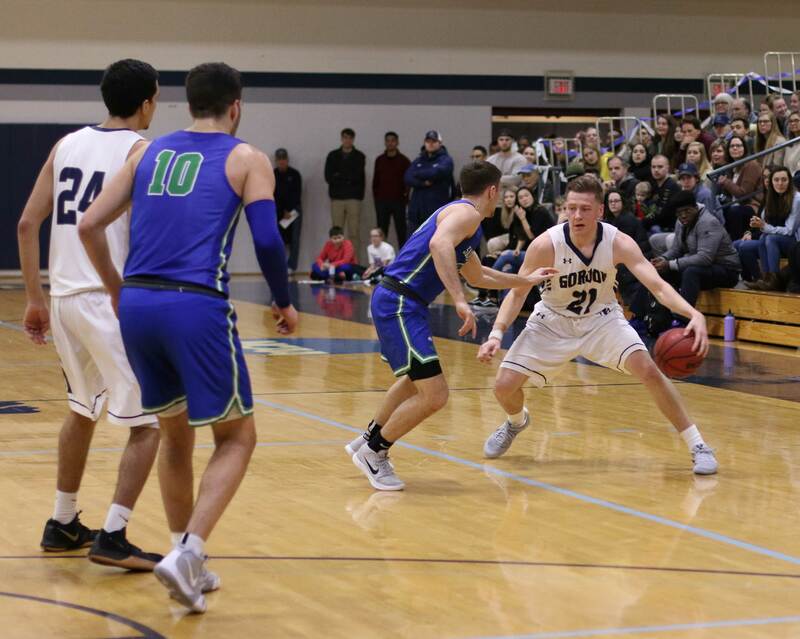 (Amesbury MA) The Scots broke out a zone defense and it worked against non-league Johnson & Wales on Tuesday night in Providence, Rhode Island. GC had lost three of their previous four games. Zone defenses don’t always work because too many open shots turn up. On this night the Wildcats, however, couldn’t capitalize long-range missing twenty-three of thirty-one attempts. 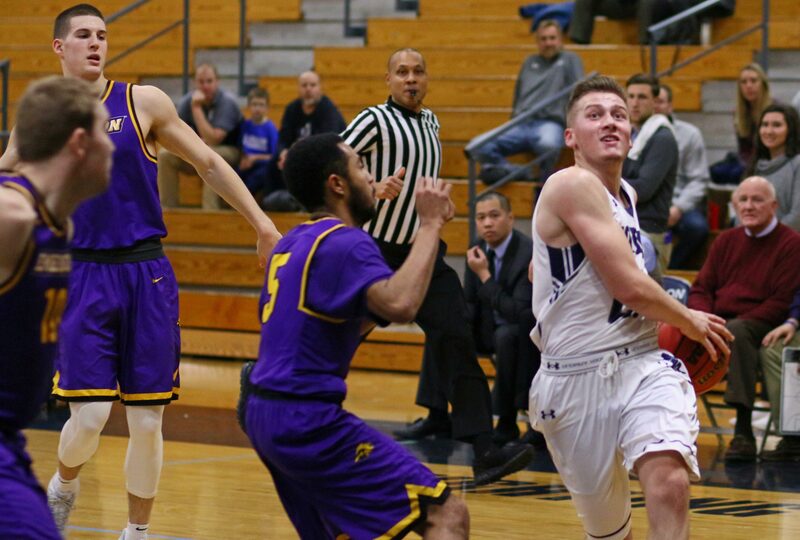 While J&W struggled from beyond the arc, the Scots had a season low in attempts (seventeen) but a season high in 3-point percentage (47%). The Scots had terrific games from Garrisson Duvivier and Eric Demers. 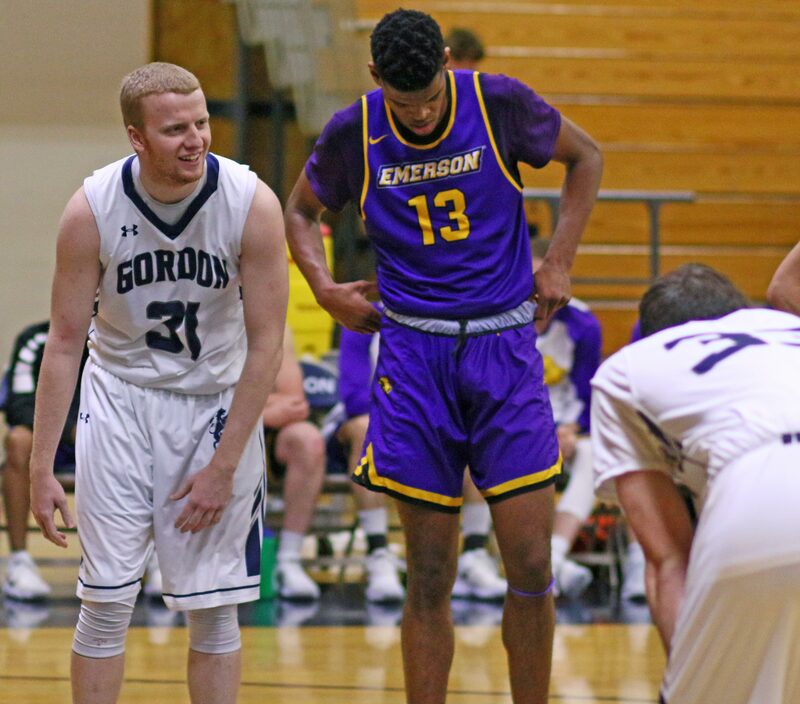 Garrisson had twenty-seven points and nine rebounds. 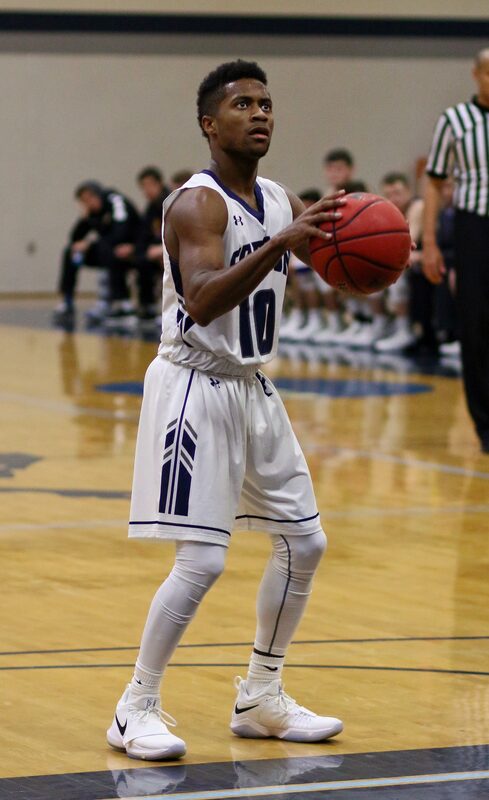 Eric contributed twenty-four points and made eight-of-eight free throws. This game had a crunch time and the talented two-some were both there to make sure that this one didn’t slip away from Gordon. The visitors led by nine (79-70) with five minutes left. Credit J&W, they rallied to 81-79 in three minutes assuring us of an exciting final two minutes. 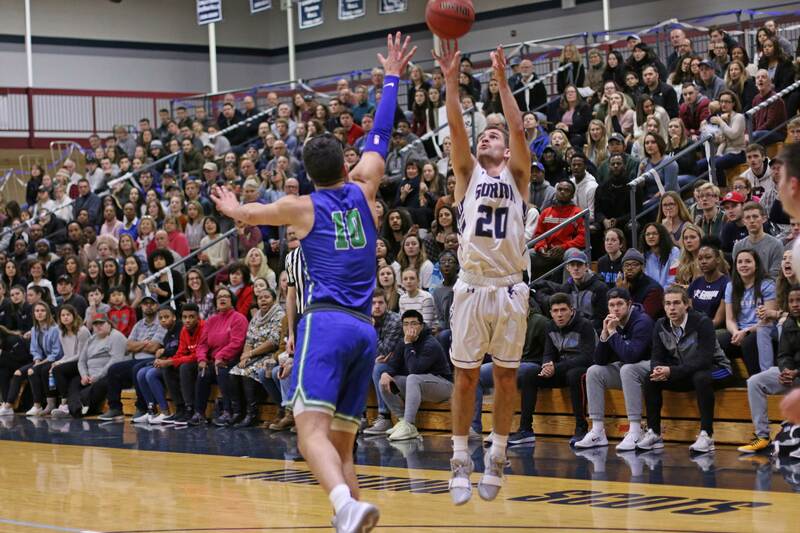 The Scots produced points in every possession down the stretch while the home team marred their’s with a turnover, two missed three’s, and a missed free throw. 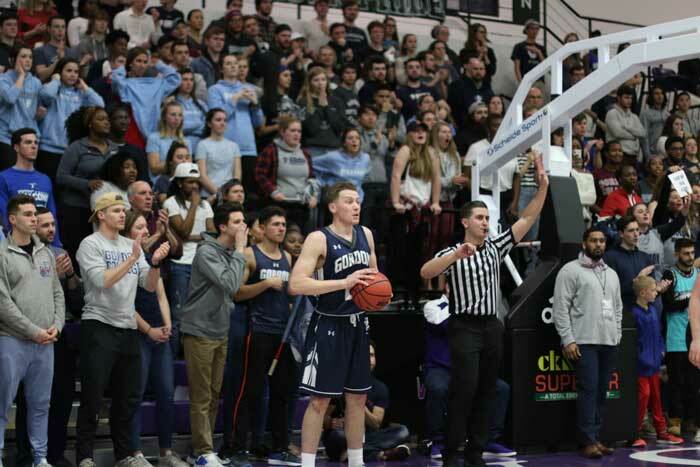 Eric Demers made both free throw attempts while his junior teammate, Garrisson, got to the basket for a layup, made a free throw, and had the GC bench jumping up and down with a thunderous dunk set up by Jaren Yang. Sometimes the difference between winning and losing is taking good care of the ball. Three days ago, Eric and Garrisson combined for twelve turnovers. Tonight? ONE turnover. The Wildcats did get quite a few good looks on the perimeter but inside was a different story. J&W had few drives to the basket. They did pass their way into layups on occasion, but they were, for the most part, content to fire from long range. 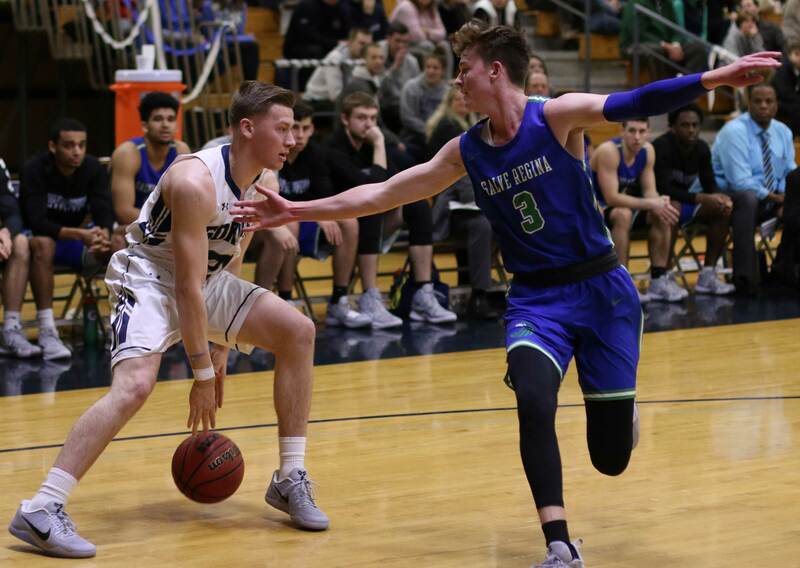 Just as zone defenses can lead to good looks, so can full-court pressure lead to the same thing. 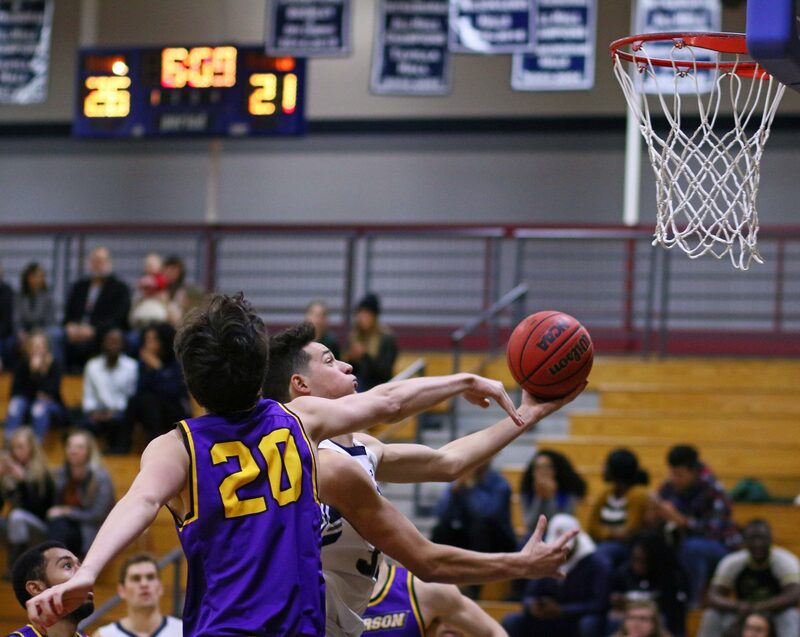 The Wildcats applied the pressure and when GC handled it they often turned up high-percentage shots. 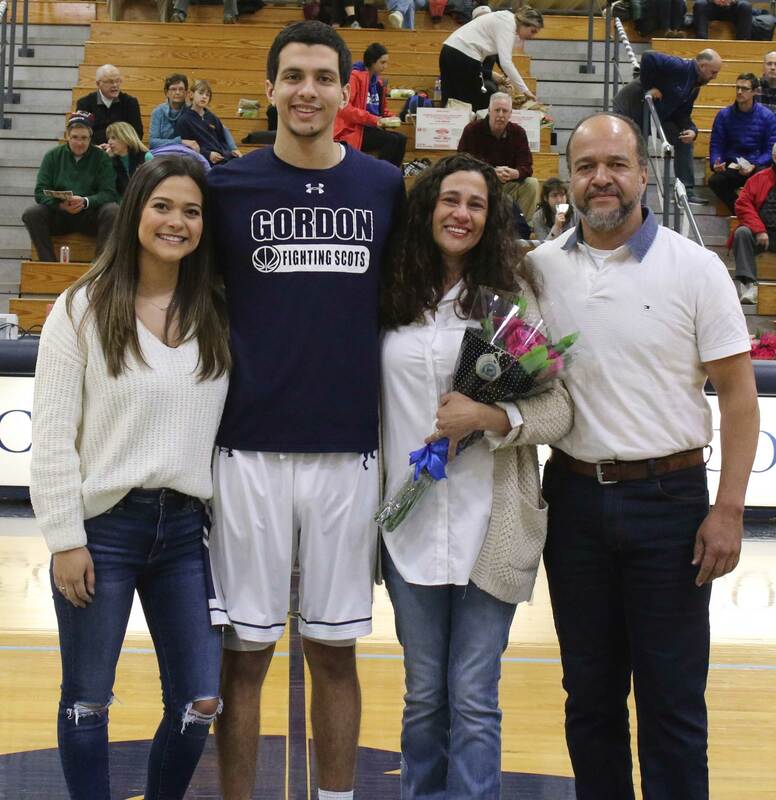 A key player for Gordon was Josh Ribeiro. 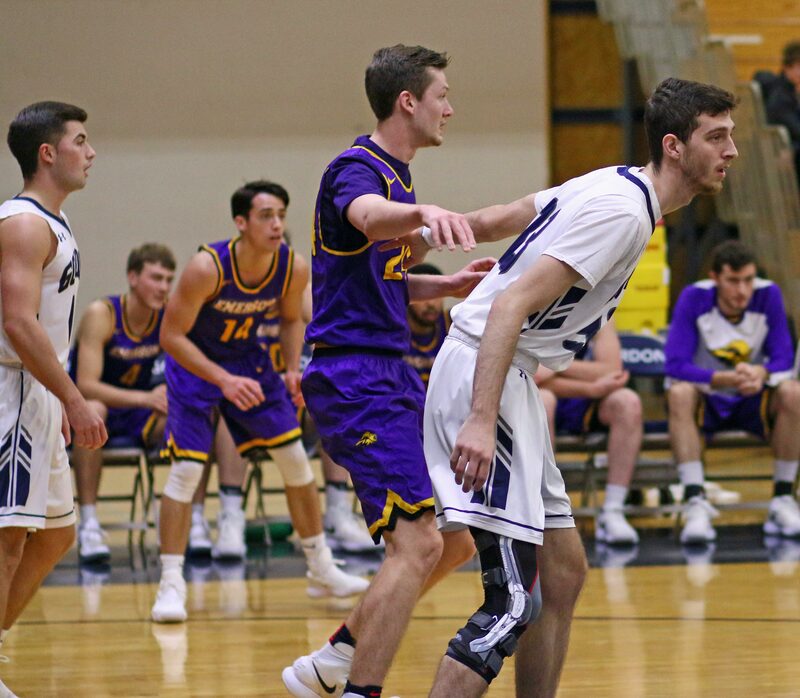 The Scots struggled to score points in the first half, but Josh came off the bench and gave them ten points in ten minutes of playing time. 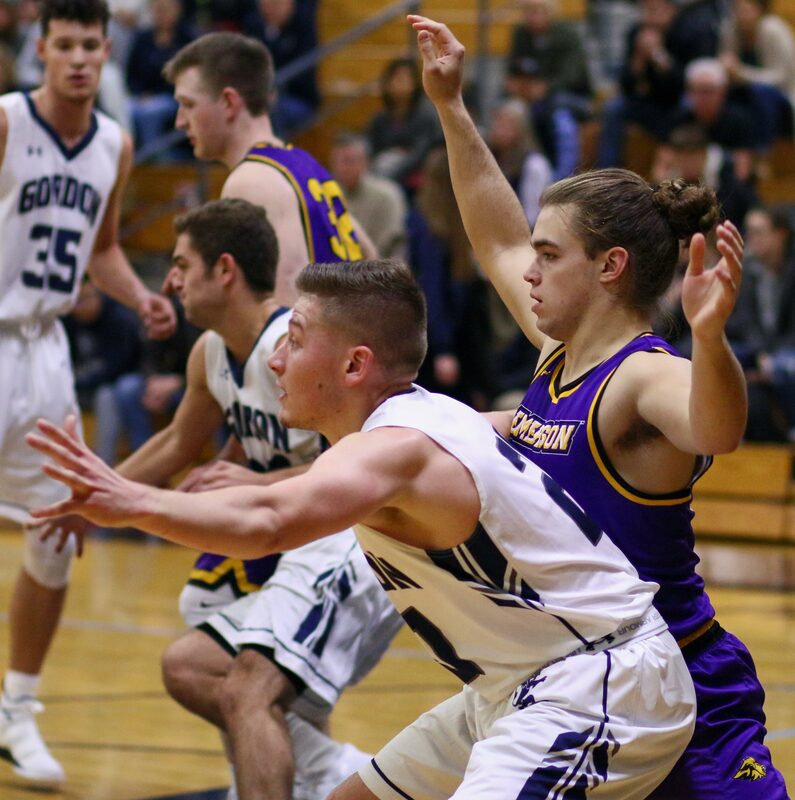 GC Coach Tod Murphy probably wondered about that zone defense in the first half as junior Matt Madoian poured in sixteen points to establish a career high in points. You expected that a cooling off period might follow and it did. Brian Hogan-Gary was terrific for the Wildcats. His stat line included; twenty points, eleven rebounds, and seven assists. Brian was closing in on a triple/double! The Wildcats had won four straight. I couldn’t tell from the J&W feed whether Wildcat Willie (official mascot) or Emiril Lagasse (celebrity chef who graduated from J&W) were in the house. 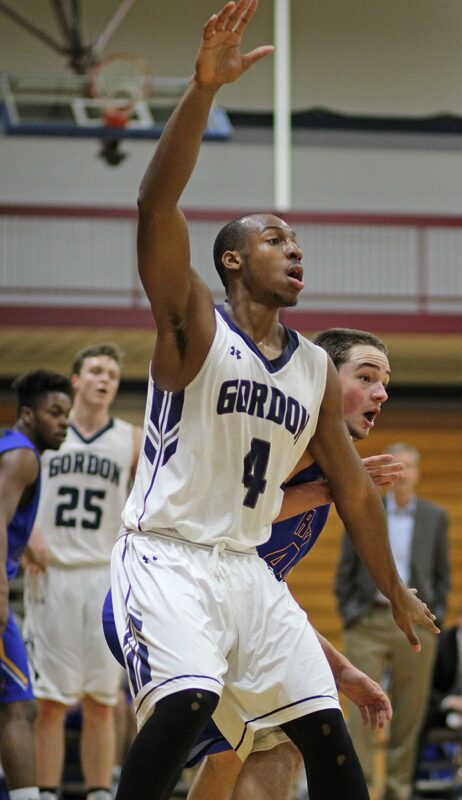 Gordon (3-4) host Emerson on Saturday afternoon in non-league play. I wonder if we’ll see some more of that zone? Johnson & Wales was 28-3 in 2015-16. (Biddeford ME) What a game! The front-runner for Coach-of-the-Year in the Commonwealth Coast Conference has got to be Ed Silva of the University of New England. A team content to nurse every possession down to the last few seconds in years past transformed itself into a run-and-gun club in the nine-month offseason. 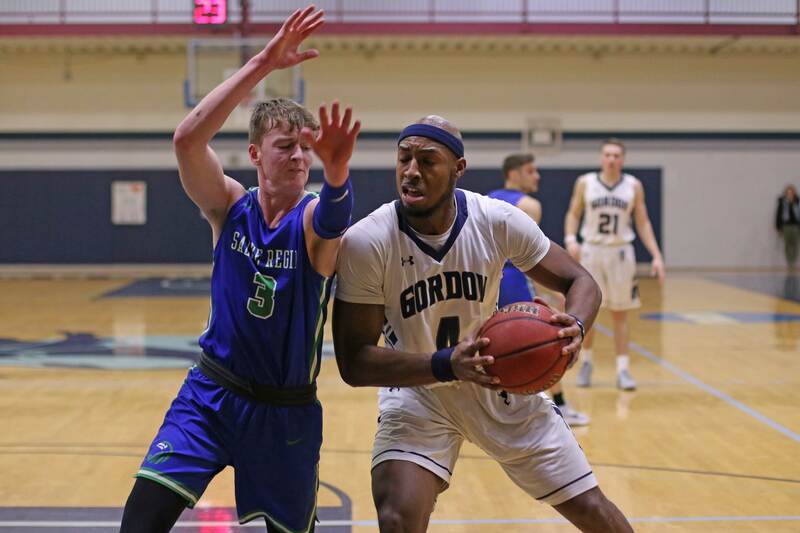 Gordon ran into the new-and-improved Nor’easters tonight, and despite a second-half rally, lost 121-113 on Wednesday in the CCC opener for both teams. I had seen the stats from UNE’s first five games and had seen a team that was putting up 3’s and forcing mistakes on the opposition. Gordon (1-2) fell victim to both categories in the first half. 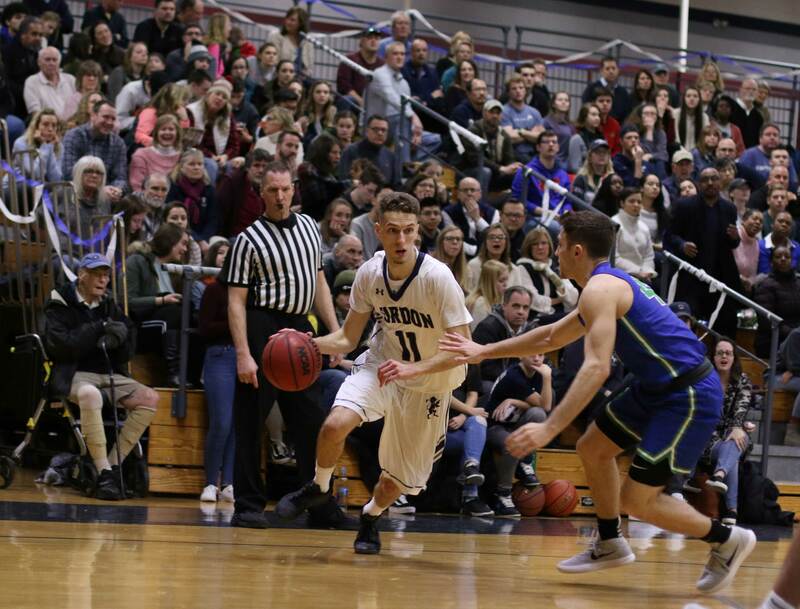 While UNE made nine 3’s in the first half the Scots committed an unremarkable EIGHTEEN turnovers in that same half. Wicked bad combo! Trailing 60-44 at the half, and the way UNE was playing, I had a sense that a serious blowout was about to happen. That sense was nonsense as GC began to look for answers off the bench and found some. 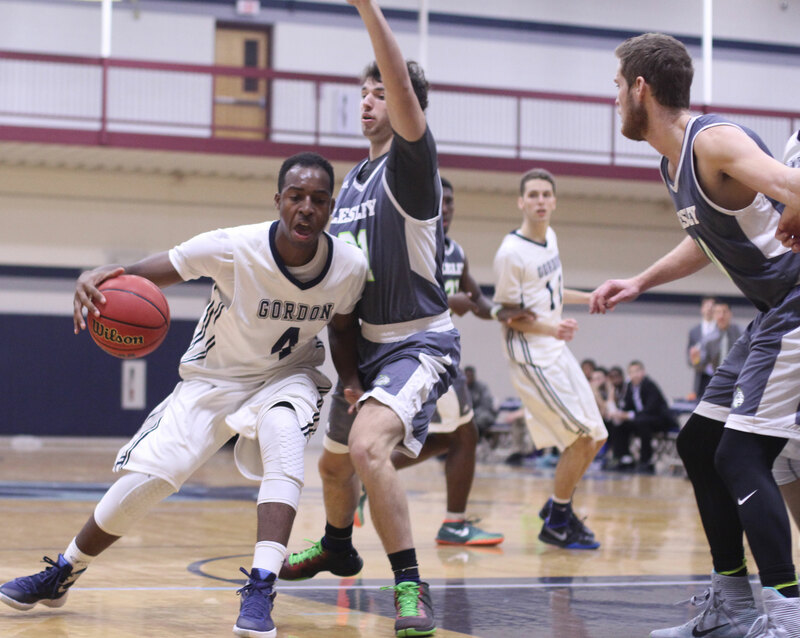 The Nor’easters weren’t giving any ground but at least GC was better taking care of the ball. 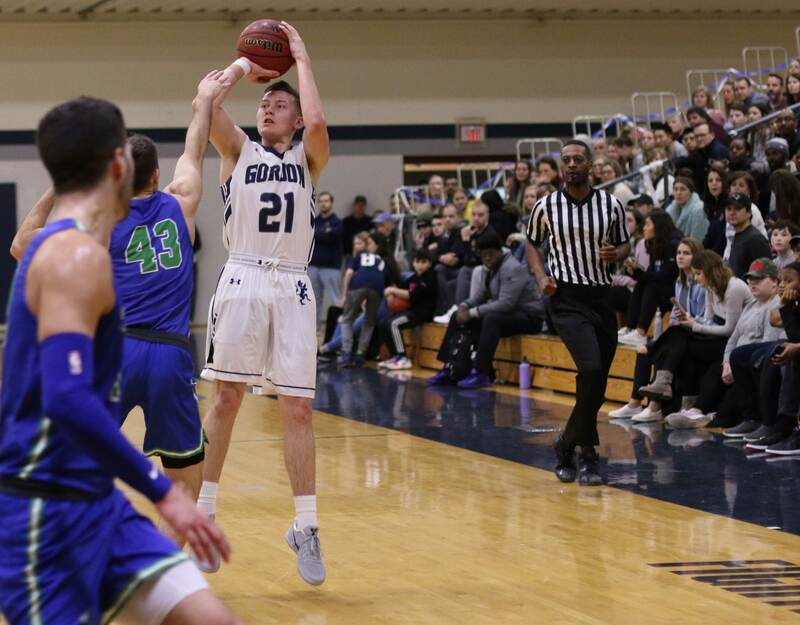 Down twenty-four points (97-71) with seven minutes left the Scots put together the best combo of scoring and defense I may have ever seen for the next six minutes. 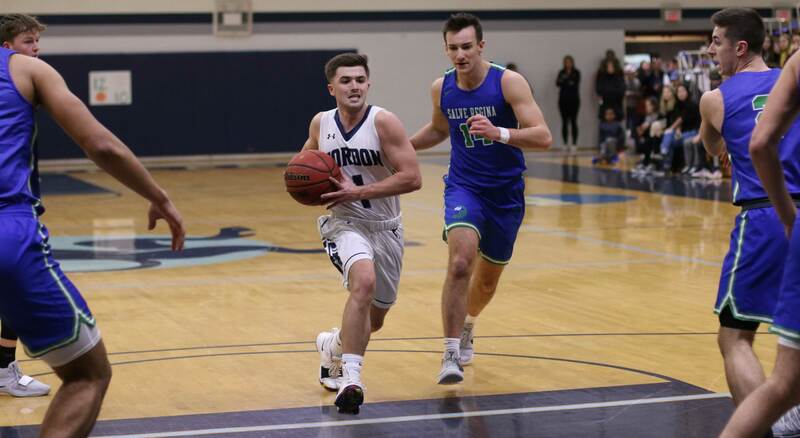 UNE’s quick shot approach turned sour as they cooled off and Gordon made appropriate passes and a steady flow of shots and got the lead down to five, 114-109, in the last minute. That’s thirty-eight points in six minutes! But it was too little too late. UNE, and I credit Coach Ed Silva for this, changed the tempo to a more controlled approach. He used his timeouts to rest his players and organize them. It interested me that previously he called timeouts just to substitute players and then cut the timeouts short. It was a whole new approach. 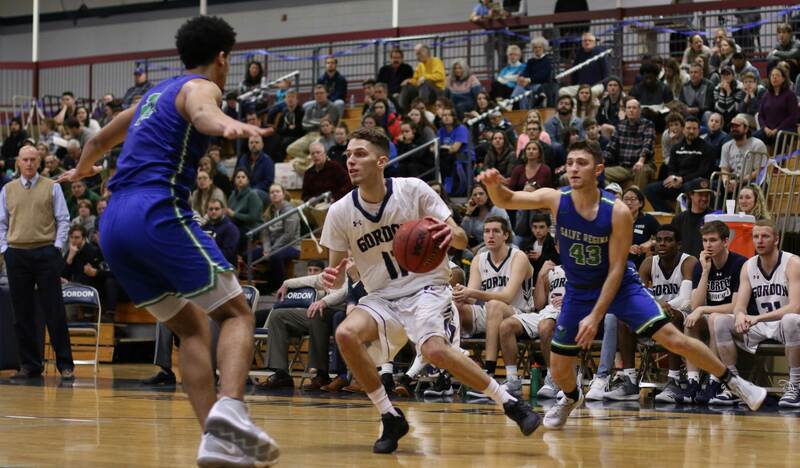 Anyhow, in the closing minutes the Nor’easters took advantage of GC’s need to overplay the UNE perimeter shooters and drove against single defenders. That approach drew fouls and on this evening those foul shots dropped and the home team had a CCC win. 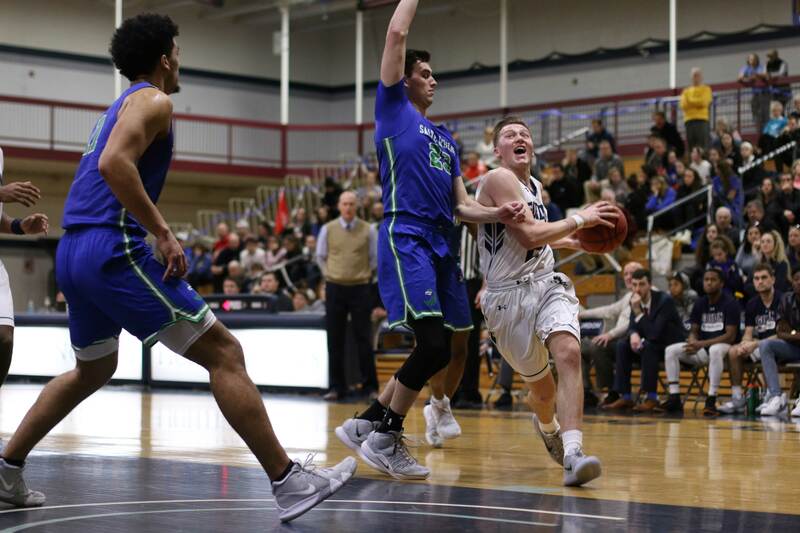 Gavin Dibble put up the big numbers for UNE with twenty-five points. Just to get an idea of the style of play, UNE had FIFTEEN different players score in the first half! They were coming in in waves with the green light shining for anyone with an opening. One casualty in this game was the Efficiency Chart. I usually put the top five in the game and normally there are at least two from each team unless the game was one-sided. That’s the top five and you would want to think that Gordon dominated the game. But UNE countered the GC top four with fifteen contributors. 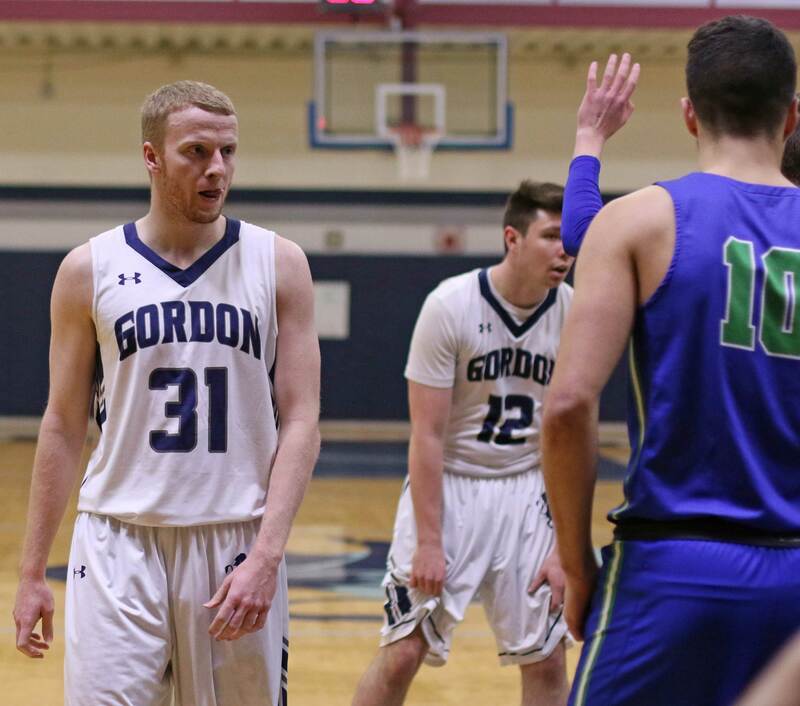 Gordon finished with a remarkable 133 on the Efficiency chart while UNE earned only a 94. Maybe that Efficiency stat isn’t as great as I think it is? It certainly didn’t hurt the home team that they got hot in the first half and turned a 12-8 deficit into a comfortable 43-23 spread in eleven minutes. 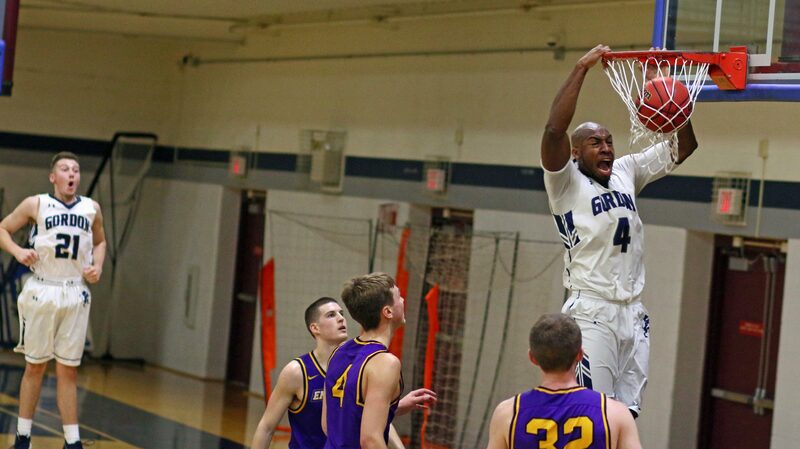 That 31-15 segment (included six successful UNE 3’s) may have been the worst GC basketball I have seen in a while. But it was that kind of game with plenty of good and also plenty of not so good. One of the struggles GC had in the first half was finishing breaks. 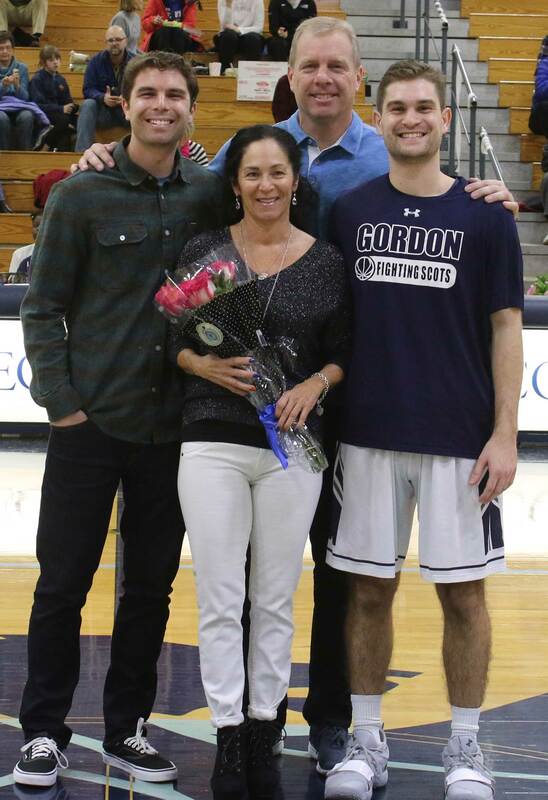 When the Scots broke through the UNE’s backcourt pressure there were some glittering opportunities for layups. Not all of them were made. UNE (2-4) was picked by the coaches to finish 8th (out of ten teams) in the CCC. I wonder where those same coaches would place UNE now? 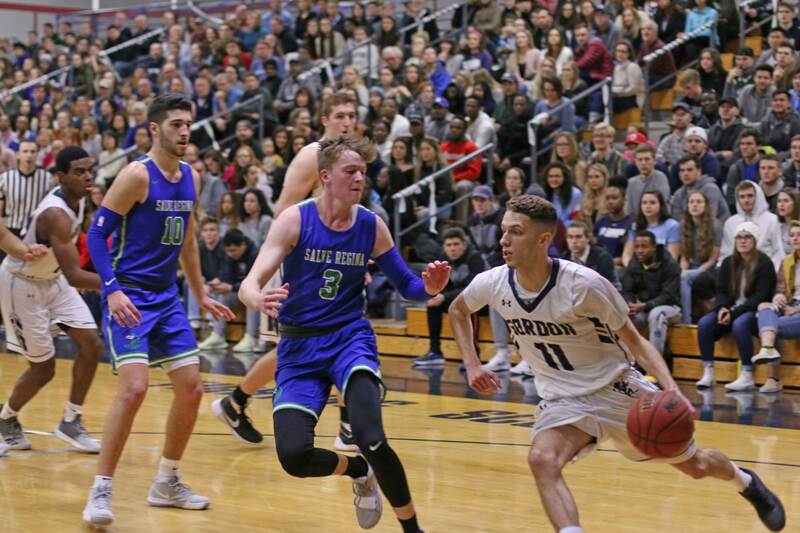 Teams that rely on a few players playing long minutes to give them most of their points will be in trouble against the UNE style. The team from Biddeford (ME) prevents teams from controlling the tempo and if their long shots are dropping, good luck. 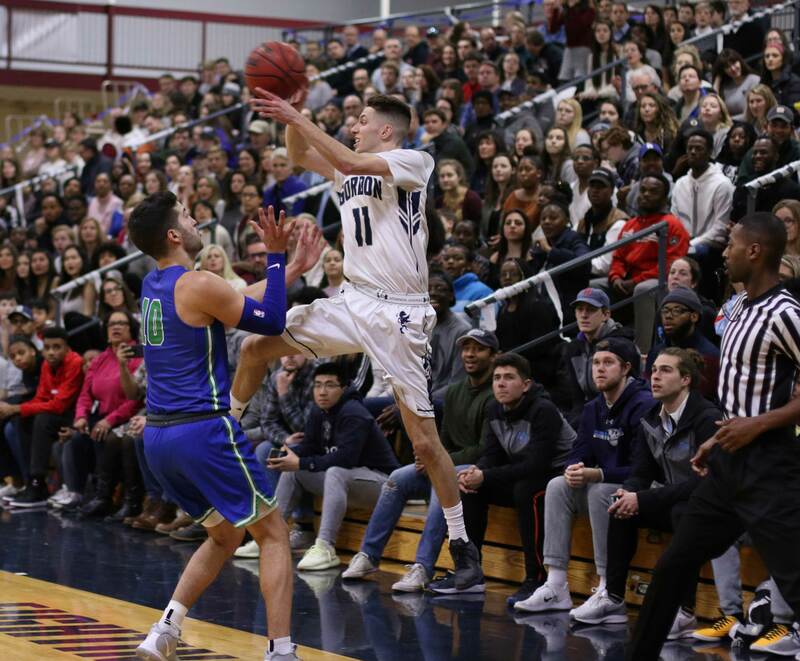 You couldn’t help but be distracted by the three UNE students under the basket GC was shooting at. Why they hadn’t painted UNE on the front of them was obviously an oversight. My theory, based on the website visuals, was that this was the before part of the before-and-after weight-loss program they were starting. Coming to the basketball court instead of the food court would be the key piece in the transition they would be undertaking. Their calisthenics showed not only promise but plenty of loose baggage. Changing their physiques from trunk to carry-on will take time but I, for one, admire their intensity. Gordon gets Nichols next. That may not be pretty. 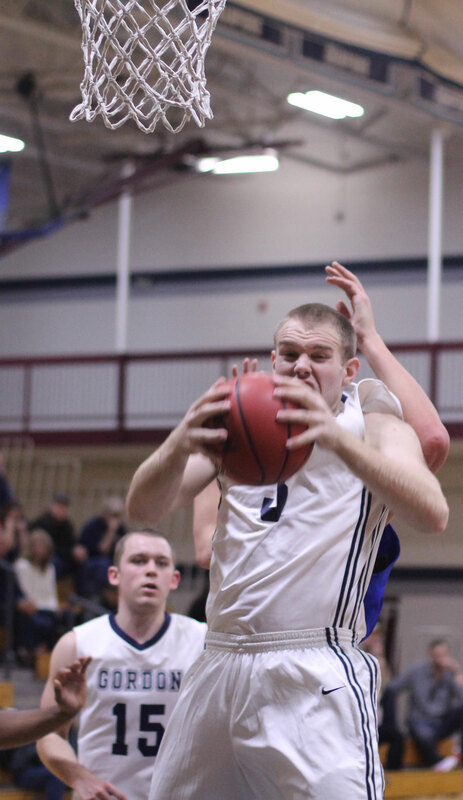 Nichols blasted Endicott tonight. 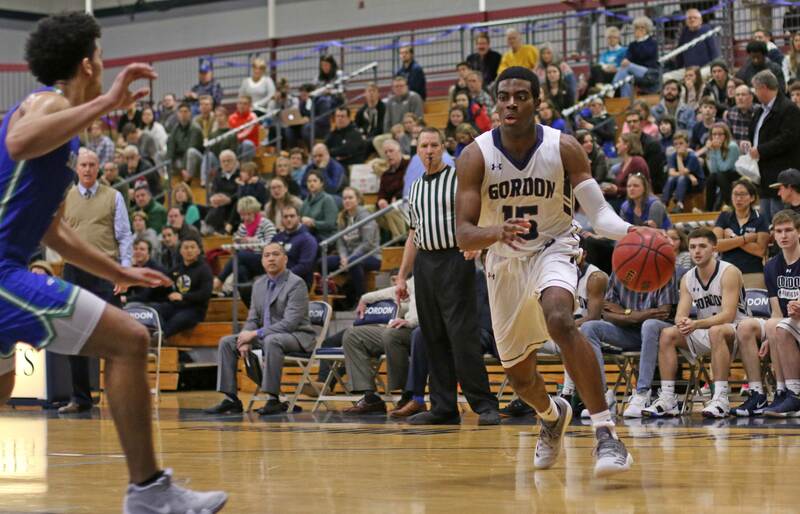 The Scots will have to find ways to match up with some very good one-on-one players in Dudley (MA) on Saturday to win this one. 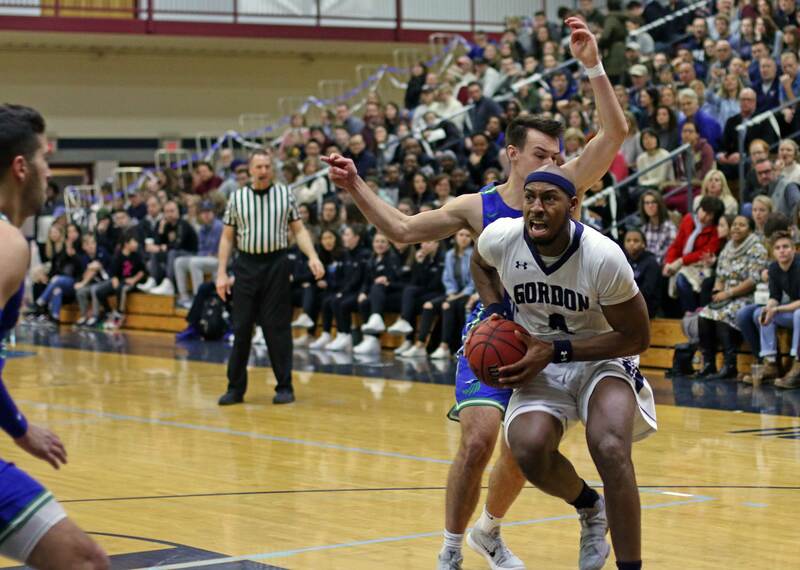 (Newtown CT) Breakdowns on both ends of the court cost Gordon and they were defeated by Salem State, 92-82, on Tuesday night at the Bennett Center. The GC online feed was terrific. 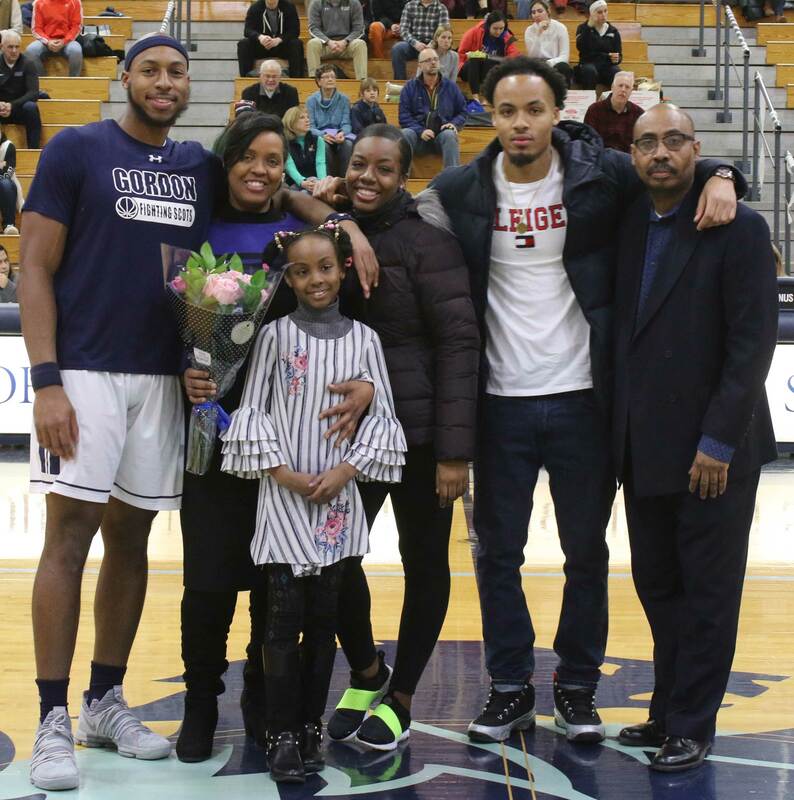 The Scots (2-2) had no answers for senior Marcus Faison. The 6-5 lefty poured in thirty-one points to go with ten rebounds and zero turnovers. Eighteen of those points came in the first half for the (3-1) Vikings. The quick visitors were able to get to the basket with alarming ease most of the time. The GC perimeter defense was shaky at best. The home team might have gotten away with the porous defense if they had been better when they had the ball. Not on this night. Turnovers (22) messed up scoring opportunities and factored in two significant first-half scoring droughts. 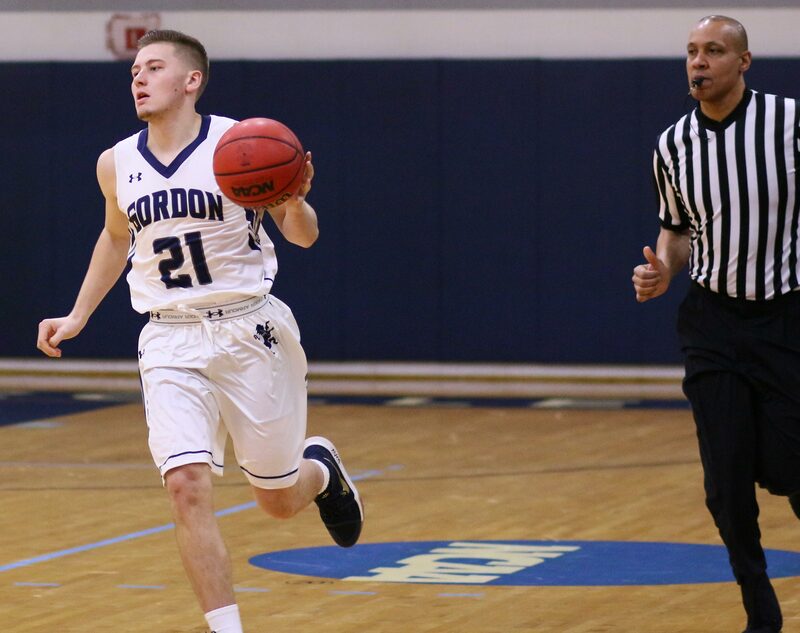 Gordon had a 23-23 tie going before tallying only two points over the next five minutes. Six of seven shooting and two turnovers happened during that stretch. The final 3:53 minutes of the first half Gordon went scoreless. Six missed shots and four turnovers were in this unfortunate run. That’s nearly nine minutes of 2-point basketball and six turnovers. Lessen that disaster and Gordon had a chance. Salem State has now won four straight in the local rivalry. 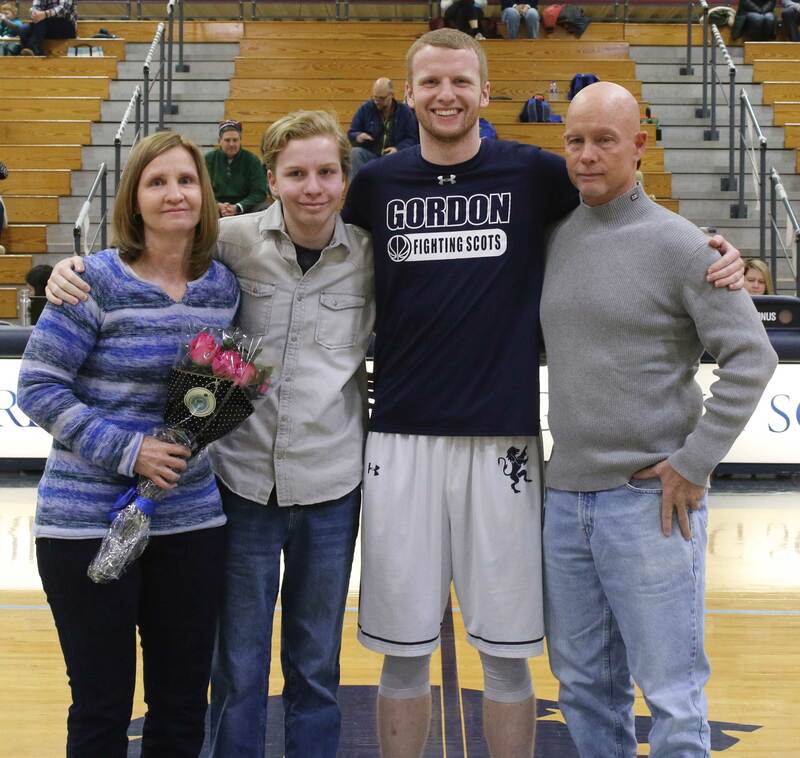 Senior Sam Johnson’s run of double/double’s reached six with nineteen points and twelve rebounds. The Scots were within four once (59-55) and five several times in the second half. Kept thinking that a run to catch up was in the making as the Vikings began to settle for outside shots. However, there were too many empty possessions (22 Vikings points off turnovers) by the home team to make a run. It was obvious that the news of Jake Haar’s outside shooting success had reached the Salem State coaching staff. 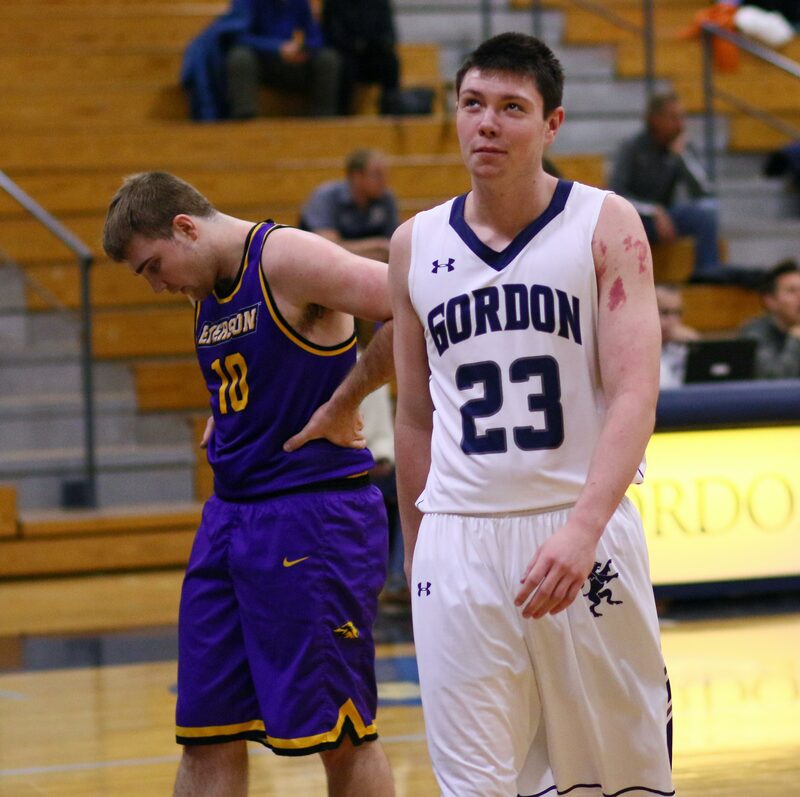 Jake was blanketed by junior Shaquan Murray and his touches and shots were very limited. 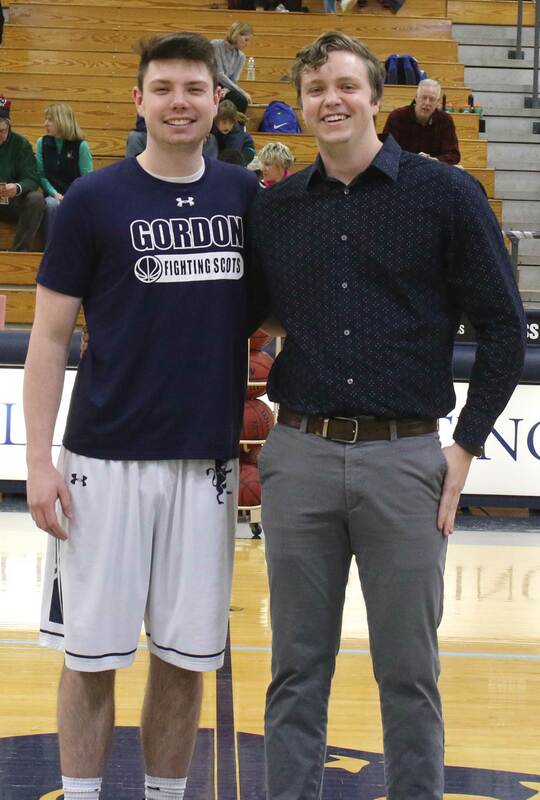 Jake Lindland (son of former GC scoring machine Doug Lindland) saw action for the Vikings. Salem State had thirteen steals without trapping. Just solid one-on-one defense. This was one of Jaren Yang’s best games. Minimized the turnovers and collected sixteen points and four rebounds. Josh Ribeiro has certainly played himself into regular minutes off the bench by hustling and making shots. He was called for goaltending in this game. Graham Tienhaara put up good numbers in short minutes (12) and came away with an efficiency grade of thirteen. 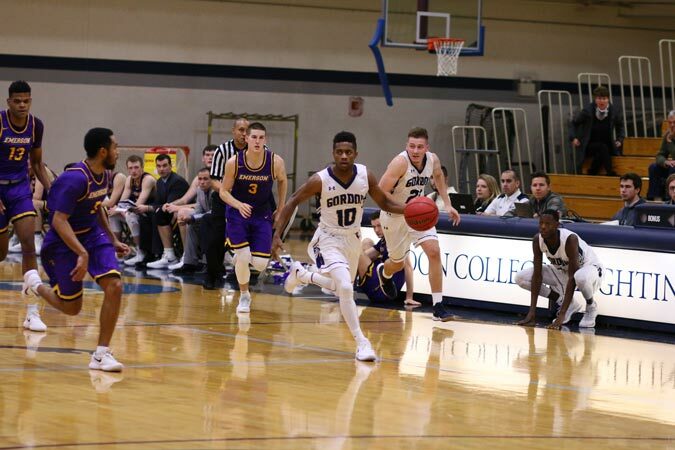 Next game for the Scots is November 30th (Wednesday) at 5:30PM at the Bennett Center. Plenty to be thankful for! 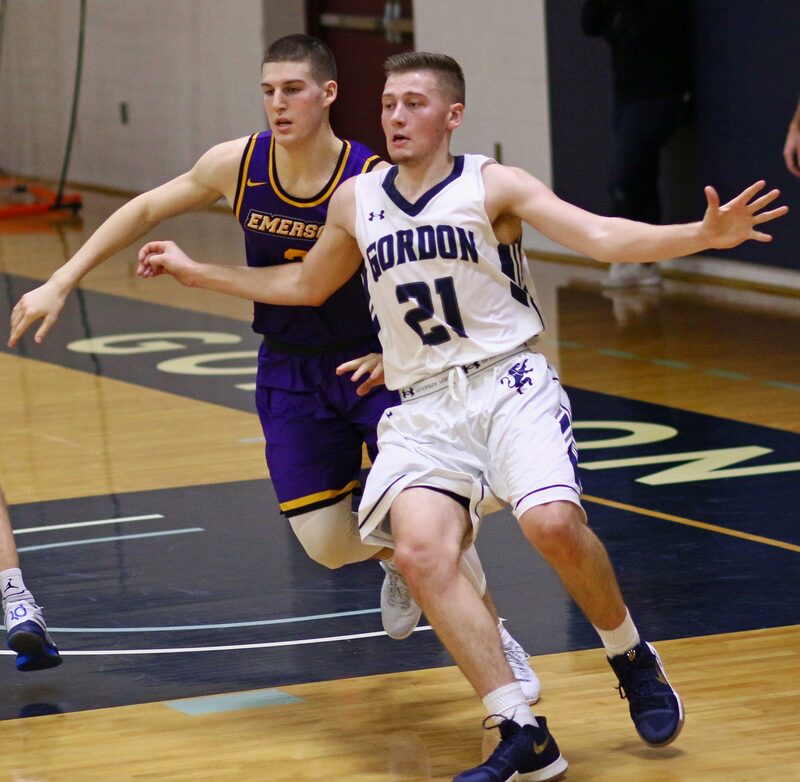 (Amesbury MA) Gordon needed a rousing comeback to win the opening round of the North County Invitational, 87-72, over Potsdam (0-2) on Friday night. But comeback they did, from fourteen down (22-8), and now have started the 2016-17 season win two straight wins. Tomorrow afternoon the Scots will take on Clarkson for the championship. Excellent video feed from Potsdam that included commentary and a visible score. It would be nice to have something like that for Gordon’s home games…….but I digress. Two games in it is obvious that Sam Johnson and Garrisson Duvivier have increased their effectiveness around the basket. Single coverage on either of them has not gone well for opponents so far. Garrisson led all scorers with twenty-two points while Sam added nineteen points to go with fourteen rebounds. 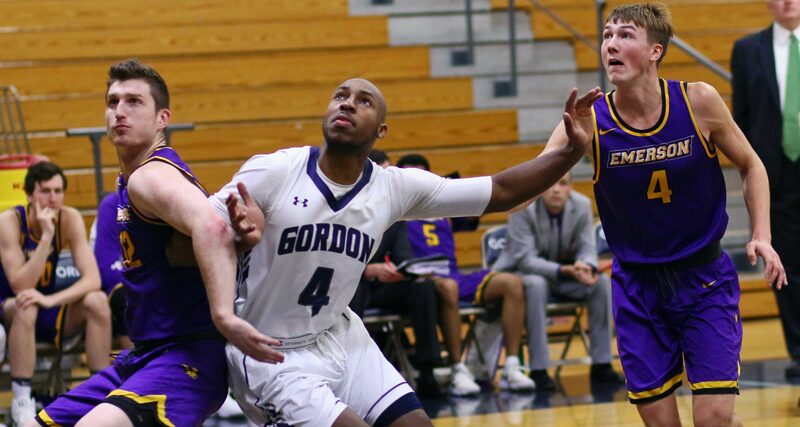 The Scots came out missing and the local team made shots and had a ten-point (42-32) halftime lead. I’m guessing that things were real interesting at halftime in the GC locker room over the way the first half went. Something kicked in after intermission and it was good news for Gordon. The Scots broke out 16-5 and caught the Bears with 16:44 remaining. 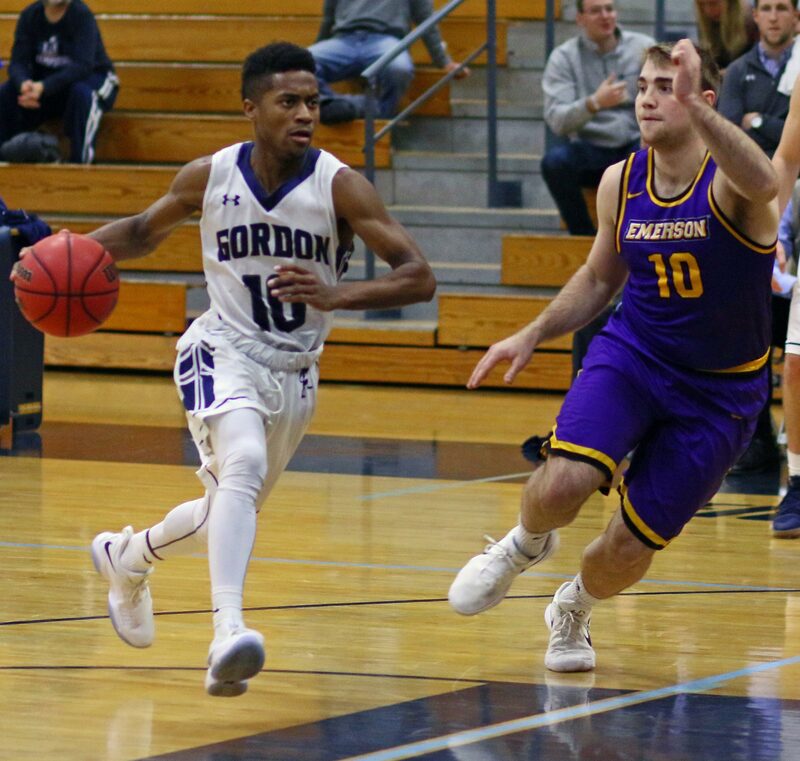 The points piled up in a hurry as Gordon rolled up fifty-five points in the second half and won going away. Sam and Garrisson played big roles as mentioned above. In this game, we also saw some of the GC depth kick in. 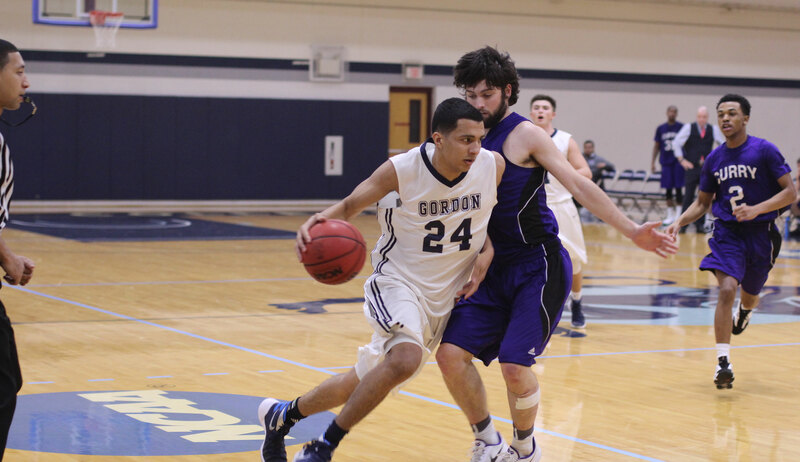 Sophomore Josh Ribeiro had a career high eight points and collected four rebounds. 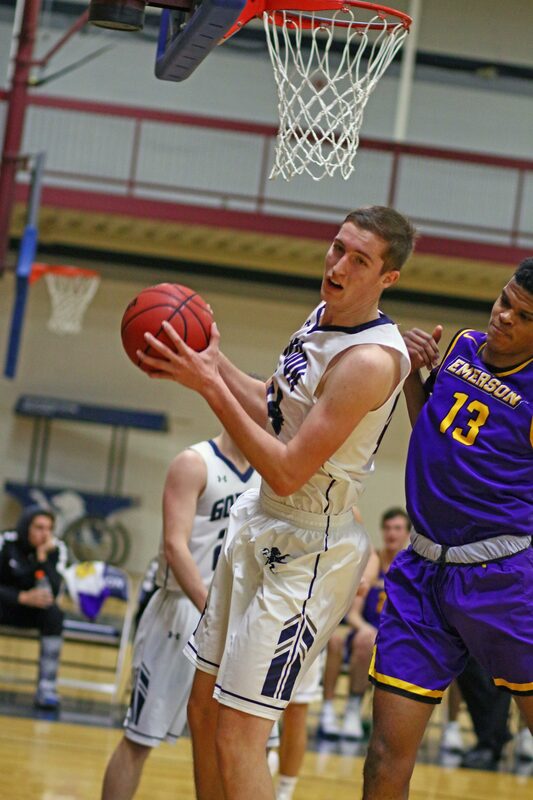 Also off the bench was junior Graham Tienhaara with a career high in points (ten) to go with eight rebounds. 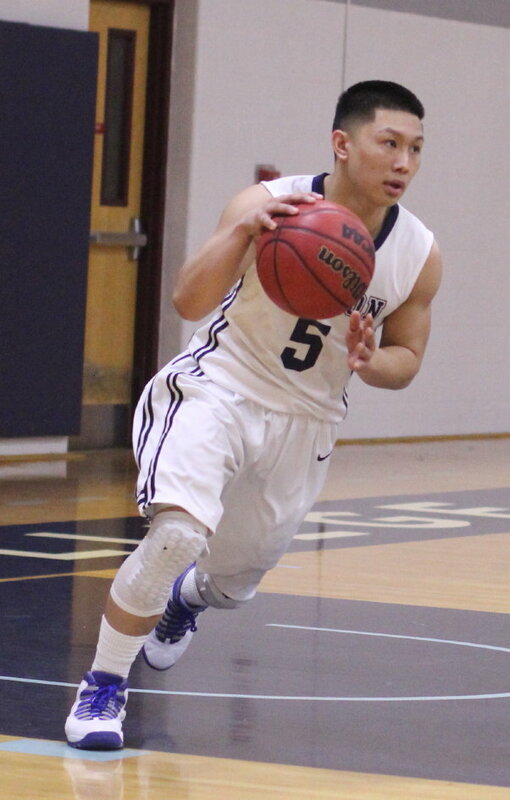 Starters Jaren Yang (10 points/2 turnovers) and Jake Hart (9 points/4 assists) have provided a quiet consistency so far that limits scoring droughts and lessens turnovers.